Regent Seven Seas Cruises is unveiling a new headphone system for guest use on shore trips. The system will debut in June on Seven Seas Voyager, and Seven Seas Navigator, and in September onboard Seven Seas Mariner. Apollo Management LP recently purchased Regent Seven Seas Cruises from Carlson. Mark Conroy remains firmly on the job as the luxury line's president. Conroy, along with Bob Binder, president of Oceania Cruises, reports to a new Prestige Cruise Holdings umbrella group for Apollo. Prestige is headed by Frank Del Rio, chairman and CEO. We asked Conroy what consumers might expect if they sail on the line this year or beyond? 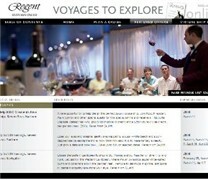 Check out "Voyages to Explore Online," a new electronic magazine for Regent Seven Seas guests and potential guests. Published quarterly, Voyages to Explore Online offers articles; details on shore trips and pre- and post-cruise packages; videos and slide shows; customized travel information based on the preferences of readers; and real-time links to Regent with offers and pricing. 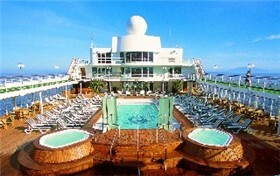 Regent Seven Seas has always operated a lengthy World Cruise but for 2009 the line plans to go one better. 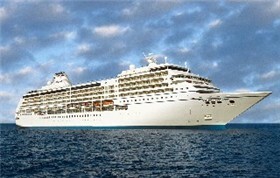 It will operate two full World Cruises -- one each on Seven Seas Voyager and Seven Seas Mariner. Come along as we take a look at what this luxury line has planned for these global adventures! 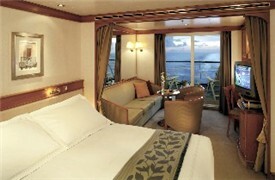 Regent Seven Seas Cruises delivers affordable luxury. Its all-suite accommodations offer spacious living onboard. Its mid-sized ships that sail from southern U.S. ports are well-liked by guests. The line has recently enhanced its culinary, wine, onboard programming and entertainment options. It's also rebranded to a more luxury monicker with Regent (from its previous affiliation with Radisson). Some come along as Marcia details her perspective on this line's product. Cruise journalist and travel writer Marcia Levin looks at the product offered by Regent Seven Seas. She outlines what cruisers can expect if they sail on this luxury line. Regent Seven Seas Cruises is known for "affordable luxury," with three all-suite, all-balcony ships that sail the world's oceans. Those ships do sail from time to time from the southern U.S. Regent also has another ship based in Tahiti. Now, all ships have received major upgrades during dry docks either last year or this past spring. Come along as we learn what Regent has done in upgrading its onboard "look" and "feel." Always wanted to learn fine cooking from a master French chef? Then you might consider booking a Regent Seven Seas Cruises voyage that includes a cooking school put on by Le Cordon Bleu, the renowned French cooking school. Multiple voyages each year feature Le Cordon Bleu topics or workshops. 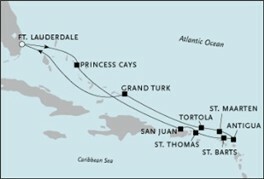 One such voyage is coming up this spring in the Caribbean.